Countries that attend Paris peace conference to call on Netanyahu and Abbas to publicly renew their commitment to the two-state solution. The countries that will attend the Middle East peace conference in Paris on Sunday are expected to call on Prime Minister Binyamin Netanyahu and Palestinian Authority (PA) chairman Mahmoud Abbas to publicly renew their commitment to the two-state solution, and to renounce officials in their respective governments who oppose it, Haaretz reported on Monday. The clause is contained in an updated draft of the conference’s summary statement, a copy of which was obtained by the newspaper. The Paris conference, scheduled for January 15, is part of France’s initiative to relaunch the Israel-PA peace talks which have been stalled since 2014. Israel opposes the French initiative, explaining that the only way to reach a peace agreement is through direct talks with the PA – which the PA refuses. 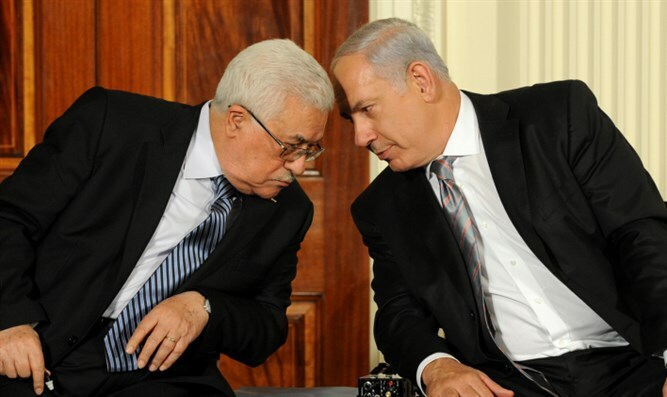 Netanyahu recently told French President Francois Hollande that he would not meet Abbas as part of the French-led peace conference, but made very clear he was willing to meet Abbas "directly, without preconditions". Despite Netanyahu’s rejection of the conference, France has chosen to move ahead with it. Western diplomats involved in preparations for the conference noted that the clause cited by Haaretz refers both to declarations that have been made by Israeli ministers like Jewish Home chairman Naftali Bennett, who called to remove the two-state solution from the agenda, and to senior PA and Fatah officials who have incited to violence against Israel. According to the draft, participating countries will stress that they won’t recognize any changes to the June 4, 1967 borders, including in Jerusalem, except for any changes the two sides might agree during negotiations. The participants will also “call on each side to independently demonstrate, through policies and actions, a genuine commitment to the two-state solution and refrain from unilateral steps that prejudge the outcome of final-status negotiations, in order to rebuild trust and create a path back to meaningful direct negotiations,” according to the text quoted by Haaretz. Last Friday, there was a meeting of senior diplomats from the dozens of Western and Arab countries that will attend the conference. The French delegate, Pierre Vimont, presented them with the first draft of the conference’s summary communiqué and asked for comments. According to Western diplomats, Vimont said France wants to reach a consensus among the participating states on a balanced statement that would stress the centrality of the two-state solution to the international community, but would take this month’s transfer of presidential power in the United States into account. After receiving comments, the French drew up the new draft, though Western diplomats stressed there will be two more rounds of consultations on the statement’s wording before the conference. The draft also addresses the role of Arab states in the Israeli-PA peace process. It says participating countries view the Arab Peace Initiative as still valid and believe in its potential for promoting regional stability. The draft further encourages closer cooperation between the Arab states and the Middle East Quartet (the United States, Russia, the United Nations and the EU) in advancing the peace process. Earlier on Monday, former Foreign Ministry Director General Dore Gold explained why the Paris conference is dangerous to Israel's future. "Israel learned through many years of negotiations and diplomacy...that the only way we resolve our differences with our neighbors is by sitting face to face at the peace table. That's how we reached peace with Egypt in 1979...That is exactly how we reached peace with Jordan...That is what works. Direct negotiations,” he said. "What is being planned in Paris first and foremost gets us away from those direct talks at the peace table into a very complex world of multilateral negotiations...That's not how we made peace in the past, and that's not how we'll make peace in the future,” added Gold.